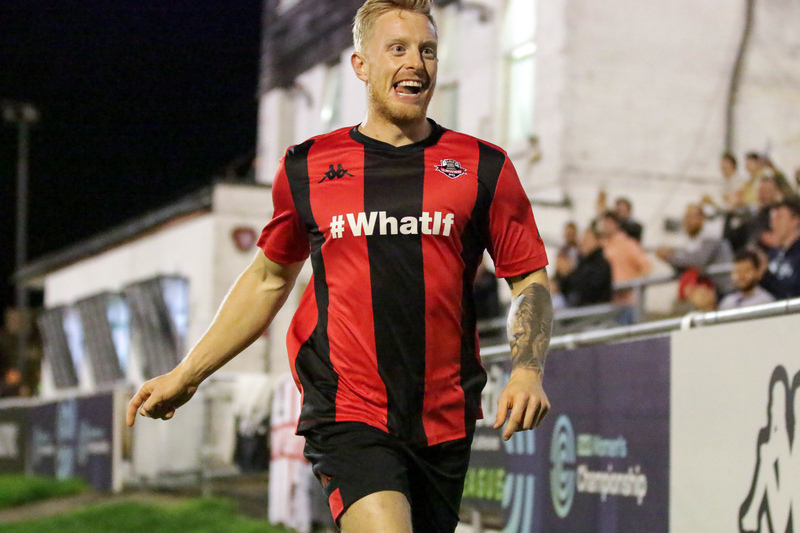 A dominant performance saw Lewes record their highest ever FA Cup victory andprogress to the first qualifying round with an 8-1 victory over Molesey at thePan. Darren Freeman made four changes to the side that had won 1-0 at Margate in theirprevious game, but still named a strong side as the Rooks looked to book a trip to Farnborough in the first qualifying round this weekend. Lewes started brightly and took the lead after just 15 minutes through James Hammond,who controlled a Steve Brinkhurst cross just inside the area and sent a powerful effort into the bottom corner after good play down the right. The Rooks were dominating possession, so it was therefore against the run of play when the visitors equalised just over ten minutes later with their first real attack, as hesitant defending down the left allowed the ball to be worked into the centre for Ryan Marklew to guide a curling effort from the edge of the area past Lewis Carey and into the bottom corner. Lewes were still seeing plenty of the ball and regained their lead after 35 minutes,as Harry Reed volleyed home from close range after Sam Johnson-Freeman in the visitor's goal had done well to save Ronnie Conlon's initial effort at the end of an incisive counter-attack. The Rooks doubled their lead just before the break, with another impressive passing move ending with Omarr Lawson rounding Johnson-Freeman before unselfishly squaring the ball for Billy Medlock to finish past two defenders on the line. Lewes started the second half in the same way they finished the first, and saw Medlock draw a fine save from Johnson-Freeman with a close-range header, before Stacey Freeman headed the resulting corner against the far post. The Rooks were not to be denied for long though, and their fourth goal was arguably the most audacious of the game, as Medlock stood behind Johnson-Freeman and waited for him to drop the ball, before dispossessing him on the edge of the area and lifting the ball goalwards, where Conlon was on hand to head in from almost on the goal line. Conlon doubled his tally just after the hour mark, collecting a pass from Leon Redwood and cutting inside from the left before guiding his curling effort round another defender and into the bottom corner. Lewes looked like scoring every time they went forward at this stage, with Johnson-Freeman forced into a fine double-save to deny Conlon and Reed. The Rooks did make it 6-1 after 68 minutes though, as Medlock was fouled in the area and dusted himself down before sending Johnson-Freeman the wrong way from the spot. Luke Blewden was introduced in place of Medlock after 76 minutes and made it 7-1 within a minute of coming on, latching onto a Reed through-ball and finishing with aplomb past Johnson-Freeman. The Rooks scored their eighth and final goal of the evening with eight minutes remaining, with Reed once again providing the assist with a low cut-back from the right which Blewden finished cleverly at the near post. This was an impressive performance from Lewes, who never looked back after going two goals ahead just before half-time, and put the hardworking visitors to the sword with a ruthless attacking display in the second half. The Rooks will hope to build on this when they travel to Farnborough in the FA Cup first qualifying round on Saturday, kick-off at 3pm. Lewes:Carey, Dome-Bemwin, Reed, Redwood, Cotton, Freeman, Brinkhurst, Hammond (Bosma57), Conlon (Gifford 69), Lawson, Medlock (Blewden 76). Unused Subs: Chappell, Barclay, Headland. Molesey:Johnson-Freeman, Labinjo, Gjoni (Hayford 65), Majekodunmi, David, Wales, Marklew, Aduseiv (Doherty 73), Oyebola, Spence (Nelson 65), Cascoe. Unused Subs: Smith-Joseph, Nwaogwugwu, Boothe.